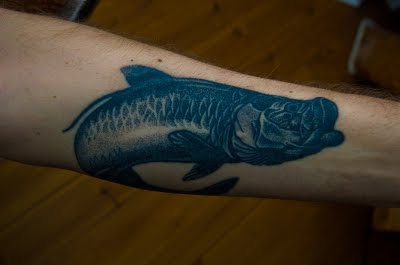 My friend Runar sent me this shot of his new and first tattoo. It took seven hours for the artist to render it on his underarm. It was created in the old school style (with a needle) as opposed to machine technique. When I asked him why he got it he said, "My better half thought I should have a tattoo, so she paid for it. What a wife I've got!!". I knew if I should convince him to get a tattoo, my only option would be to appeal to his big addiction for the fish that I believe hosts a greater admiration than I do: The Tarpon! Perfectly said Kristin and strategically brilliant. Thanks for sharing.